We can offer turnkey palm oil refinery plant solutions from plant layout design, machinery manufacturing, onsite debugging and installing. The production capacity ranges from 1 ton/d up to 400 ton/day. Send ~us an inquiry if you are interested in start palm oil refining line or factory. We are always glad to give suggestions for your business! Read more: What is Batch Refinery, Semi-continuous Refinery and Continuous Refinery ? 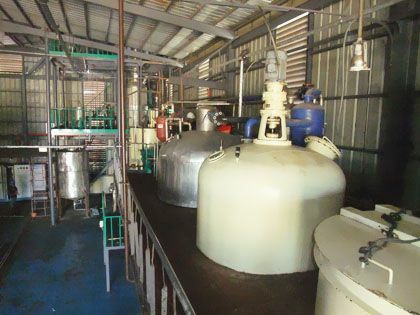 The following is some onsite photos of our edible oil refining projects. Feel free to contact us if you are interested! Read more about "Physical Refinery or Chemical Refinery? Which One is Best for Palm Oil Processing"
Physical palm oil refining process is the most common used type in palm oil processing industry. 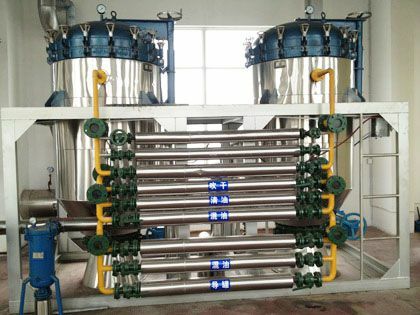 It is featured of low production cost, high efficiency, simple production process and low effluent load. When refining crude oil with high carotene content, high initial FFA (up to 5%) and low phosphatides, chemical oil refinery plant is suggested, considering operating costs and refining losses. I would like to visit your factory to arrange for a 20 ton daily capacity crude palm oil degumming and deodorizing plant.I live in the USA but this plant will be installed in Africa.So as soon as you can set up a date for me to visit your factory, I will be there.Thanks. 1. which country does the project locate in Africa? 3. How many people and when will you come, we'll arrange for you accordingly soon. What's your contact info, such cell, skype, whatsapp... so we could talk directly. As a professional company in manufacturing and exprting oil and fats complete equipments for years. We've exported lots of turn-key projects abroad every year, as for Africa countries, such as Senegal, Egypt, burkina faso, Cote d'Ivoire, Ghana,Tanzania, Zambia, Nambia and Mauritius, and we'll build a project in Nigeria soon. As for the project in Cote d'Ivoire, it's a 10TPD refinery project for coconut oil, now this customer had changed the raw material into palm oil. So we just provided another set of complete equipments of 10TPD fractionation line, i guess that this project will be finished early next year. Hope above info could give you some confidence to carry on this project in Cameroon. Does your company source or manufacture centrifuges and decanters for the processing of waste palm oil. We are looking for 2 to 3 tonne per hour decanter for solids removal and a centrifuge for water removal. Please advise. Thank you for your attention to our products. Regarding to the palm oil refinery,the process is as follow: degumming, deacidifying, bleaching, deoodorization. fractionation. 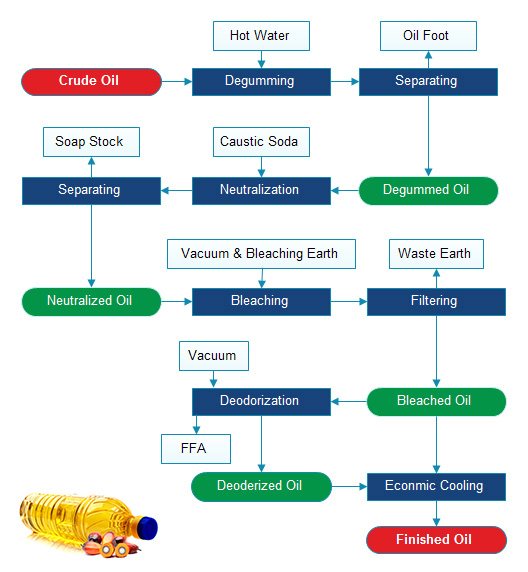 Please inform us which section you needs.or inform us the finished oil standard you want, then we can check the processing details for you. Bottles and plastice jerrycans making machine for fillwing with refined oil. 3.Filling,capping and labelling machines. Regarding to the capacity 25TPD, we donot suggest to make the jerry cans by yourself but buy from the factorys. Regarding to the oil filling machines, please inform us how many hours you plan to work each day. How many tons you plan to package? only design for 25tpd or larger capacity on? Please kindly inform us full information of your company, we will make the special file of you. Tks for your enquiry to our products. 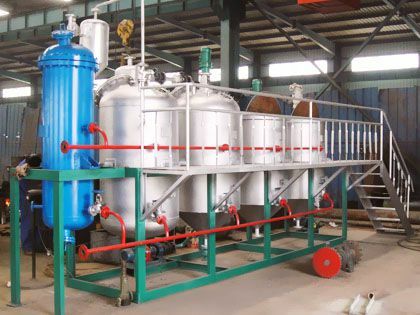 Do you have oil pressing plant or buy crude oil from outside directly, could you tell us the oil index of your crude oil, such as acid value, colour, peroxide value, etc. How do i remove odour from palm jernel vegetable oil?....please can you be very precise in answereing the question so i can understand clearly.thank you. "Deodorization" is the way to remove the bad odour, pls inform us your capacity and your current process flowchart. So we could go for further details, thus suggest and quote for you accordingly soon!